If you followed this blog back when I used to update it every few days (I now call that The Maniacal Period), you may remember a dude named Steven leaving a comment on a post in 2010 saying some very nice things. Steve and James O-L are brothers. They’re also in a great local band called James O-L and the Villains, two of the nicest guys you’ll ever meet, and both capable of growing some great beards. Unexpected musical situations seem to have a habit of wandering my way. For example: here is an album I produced for someone else, if a producer is something I can call myself, at a time when I didn’t think it was something anyone would want to ask me to do again. 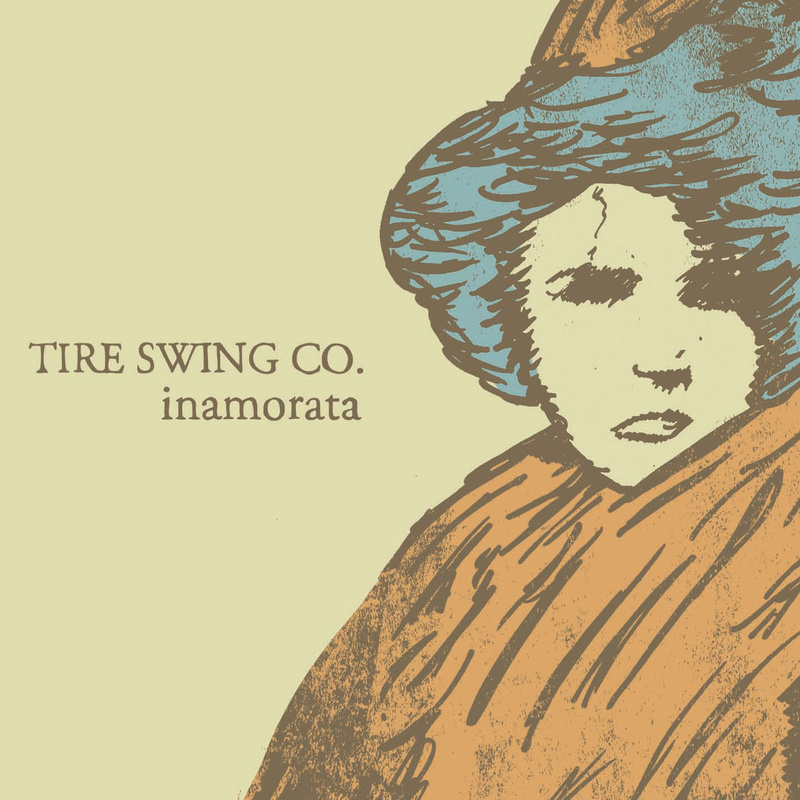 Tire Swing Co. is the band name, part in-joke, part Jason Molina tribute. Steve wrote and sang the songs, James came by to lend some tasty electric guitar and bass to the opening song, Kaitlyn Kelly sang some gorgeous harmonies on two others, and I did my one-man-band-of-session-musicians thing — something I hadn’t done outside of my own music since Travis Reitsma’s OUTSIDE THE FACTORY GATES back in 2010. Steve has a really interesting, unique voice. I like interesting, unique voices. On Travis’s album our vocal ranges are similar enough that if you don’t read the liner notes you might assume he’s singing all the harmonies himself. In this case there’s much more of a contrast, and I had a lot of fun playing with it. Of the seventeen songs on the album, there’s only one that doesn’t have me singing on it somewhere in the background, and that’s because it’s an instrumental track and no one’s singing on it anywhere. Unless you consider a banjo to be a voice. Steve played my 1951 Gibson LG-2 throughout, and I was reminded again what a great recording guitar that thing is. I played a lot of my newer Martin 000-15. I liked the way the different tones of those two guitars played off of each other. The funky old Teisco wormed its way into a few songs (most notably the ambient volume swell stuff on You Held Me by the Ocean and Holding You, Back). So did the long-neglected Epiphone Casino and Fender Strat. There’s even some ukulele in one song. There’s even a ukulele solo! The songs were recorded here and there over a period of about six months, stretching from the winter of 2012 to the soft belly of summer in 2013. I guess you could stick the album in the “alt-folk” category if you felt a burning need to stick it somewhere, but I think there’s a nice amount of variety and a lot of different sonic things happening, whether it’s a bit of delay coming in at the end of a piano solo, spooky-sounding combo organ worming its way into a chorus, or the African drums gluing a song together in the most unexpected way. That last one was Steve’s idea. The sound works so well, in the last song I ever would have thought to use it, it’s insane. Sometimes I forget how useful it can be to have access to so many random noise-makers. It’s good to have friends around to remind you. There are some mistakes here and there. That’s kind of par for the course with anything I record. I enjoy those humanizing moments and make a point of keeping them around. I expect I always will. We didn’t use a click track anywhere, so sometimes you’ll hear something slow down a little (there’s a moment I love when Our Love Was Bound to Die comes back from a false ending sounding like it’s trying to pull itself up a steep hill) or speed up a little (A Puddle in May) mid-song. Or you’ll hear a bit of between-song banter, or nails clicking on piano keys. I’m sure there are some people who think those things sound unprofessional. That’s a valid opinion. Me, I’ve always felt the little bits of imperfection and messing around have a way of grounding the music and giving it a stronger sense of place. In this case the place is a room in a house with some instruments and recording equipment in it and a piece of paint missing from the ceiling near the piano. Lucky for me, Steve shares those “let’s not overlook the peeled paint in the room” sensibilities. And there are some things that were just necessary mistakes. 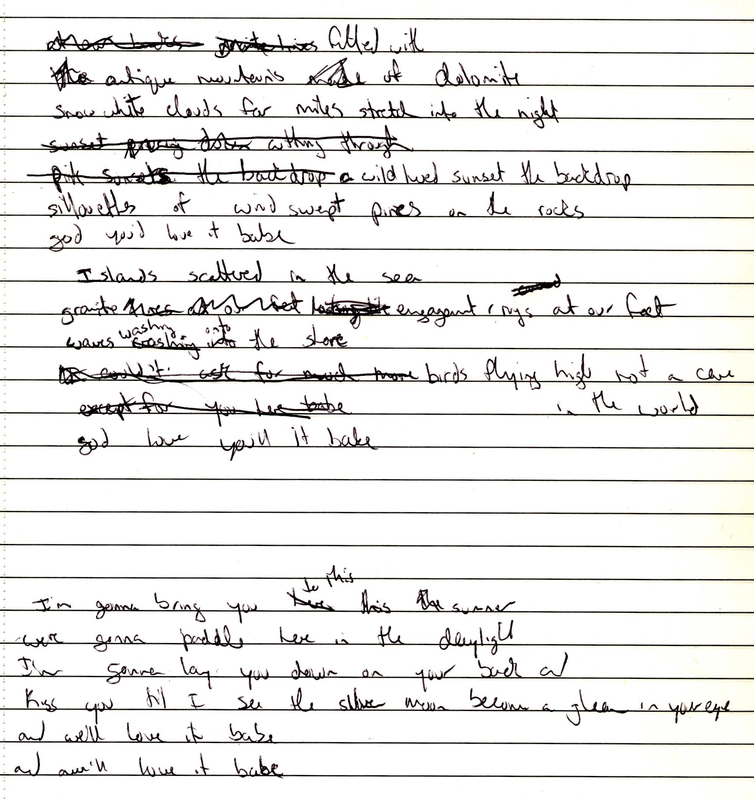 Steve nailed the lead vocal for You Held Me by the Ocean the first time out, so we kept the first take and moved on. It wasn’t until a little later that I realized I was so wrapped up in the music I had the mic preamp the vocal mic was going into running a little too hot, and a few of the more forceful moments came out sounding a little crispy. Saner people would re-record the vocal track. I was convinced that take was the best one we were ever going to get and it was perfect the way it was. I didn’t want to mess with it. So I kept the take and did what I could to soften the crispy bits by riding the fader. On Marie, Marie, Quite Contrary, when Steve came back in for the sped-up ending I grabbed a shaker and started shaking, and for the first few seconds I was too close to the guitar mics. So for moment the shaker was too loud in the mix, and there wasn’t much I could do about it. Though I didn’t write any of these songs outside of helping out with a rhyme or two on The Maple Tree, I was given a lot of creative leeway when we were recording. That was both a great compliment and a little unnerving. It’s a great feeling when someone trusts your creative acumen enough to say, “Here’s a song. Have fun with it. Do your thing.” At the same time, you want to contribute whatever ideas you might have without derailing the songs or projecting your own sound onto them too much. So your musical brain has to pull out some different dance moves than the ones it might normally reach for. I think I only really went off the deep end once. There was one song I had a whole mess of ideas for, so I ran with them, and when I stopped running I looked up and saw I’d kind of altered the whole shape of the thing. 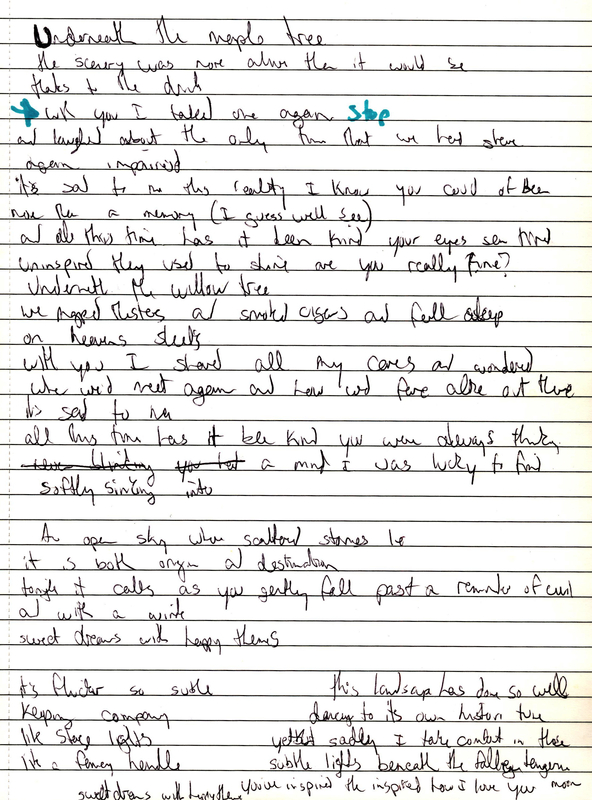 To my relief, Steve was happy with what I did, and that song’s on the album. It’s called The Maple Tree. Anything that sounds like a synthesizer is a Fender Strat played with a lot of reverb and manual volume swells. I couldn’t tell you where that guitar solo at the end came from. It was another one of those things that just happened, without any premeditation. I think it’s one of the best guitar solos I’ve played in my life. It almost feels like it tells a story. It wouldn’t exist without the great song Steve wrote inspiring me to find that sequence of notes somewhere in the part of my brain that speaks to my fingers. This is an album I would enjoy listening to even if I wasn’t involved in the recording process. But I was lucky enough to get to play a part in its creation, and I think it’s maybe the single best piece of work I’ve ever done as a producer of someone else’s material. If there’s one thing I’d reach for to hold up as an example of what I can do when I’m recording songs that aren’t my own and working out a lot of my own musical muscles, this would be it.